MEDIA ROOTS- In 2002, Jeanmarie Simpson co-adapted the book, Amigas: Letters of Friendship and Exile, a chronicle of correspondence between two Chilean friends separated during the Pinochet era. The theatre adaptation, Amigas, won a 2003 grant from the National Endowment for the Arts. Later that year, Simpson stumbled across a reference to Jeannette Rankin, lifelong pacifist and the first and only US Congresswoman who voted against US entry into both world wars. Her discovery of Rankin led to the production of A Single Woman, a play that toured worldwide and was subsequently made into a a film featuring the talents of Martin Sheen, Patricia Arquette, Peter Coyote, Judd Nelson and Joni Mitchell. In 2008 Simpson co-adapted another book called Powder: Writing by Women in the Ranks from Vietnam to Iraq into a solo piece called Coming in Hot. She has performed the show dozens of times in Arizona, California, Washington and Nevada and has garnered rave reviews on Huffington Post. A documentary film about the play is currently in production. Simpson’s newest solo play, Mary’s Joy: The Anatomy of a Martyr, is ready to meet the public and has already been performed at a school at CU Boulder. I had the honor of sitting down with Jeanmarie Simpson and getting some insight on her work, art, and what it means to be a self proclaimed “artivist”. Cynthia Schwartz: How do you choose your characters? How do you decide whose lives are expansive enough, or interesting enough that you could step inside them and actually become that person on stage? Jeanmarie Simpson: I guess it’s my enthusiasm for clarity and justice and my feminist heart that leads me to the characters I want to write about and play. I love that these women speak for me, they’re a joy to make a case for, as an artist, because I am so moved by them and their lives. CS: When you get something back from the audience, does that feed you not only as an actor, but do the characters respond differently during different performances? JS: Absolutely. My work is deeply responsive to the energy in a room. When the audience is lively and engaged from the get-go, then so is the character. When an audience is more subdued, the performance will be sensitive to that and not seek to overwhelm them right off the bat. That’s the beauty of live performance. It’s an intimate communication. I feel so honored every time anyone is willing to sit and watch and/or listen to me for two hours. CS: Tell us about Mary Dyer. She was hanged for being a Quaker? JS: Yes. She was hanged on June 1, 1660, for being a Quaker in Boston, specifically. She had been banished and kept returning. CS: The play is subtitled “the anatomy of a martyr.” Can you dissect that for us? JS: Sure. Whenever an event as dramatic as an execution happens, people become very interested in the “why” of it, and become really curious about the background of the person. We, as a species, seem to be fascinated by criminals who are killed by the state – I mean look at all the documentaries and TV shows that go over every little detail of their childhoods, etc. In Mary’s case, I was deeply intrigued by the notion of a colonial woman with six living children, one of them an infant, getting on a ship alone and going back to England for seven years. I knew she was one of the first Quakers and that she was hanged by the Puritans in Boston, but it’s her relationship with her husband and children that really hooked me- the trajectory of her life led to such a scary ending. She was incredibly determined to get through to the authorities, to turn their hearts, and that determination kept her moving forward. She believed that if she kept advancing in the struggle, something really beautiful would happen. CS: Almost sounds like a suicide bomber. JS: Hmmm. Yes. Maybe so, in terms of dying and believing in something beyond death, but she didn’t take anyone else with her. She wasn’t a killer. CS: Many people view suicide as a selfish act. I can see how some might say that Mary Dyer is profoundly selfish, leaving a husband and all of those children behind to miss her and be left with such horrible images of her death. JS: True. That’s a theme that is very true, no matter when it happens, today or 350 years ago. Without giving too much away, I think when people see the show and hear Mary’s story, they’ll maybe gain some understanding and a bit more compassion towards people who may be dealing with depression or suicidal thoughts. To label those people as selfish is really too easy. There is a community of complex human beings who suffer from mental diseases and they are really punished for it, by society in general. The stigma is much more powerful than is the the movement to make sure there’s plenty of help for troubled people. So many things can trigger chemical changes in the brain that can lead to all kinds of disorders. I think anyone who lived the life Mary Dyer lived would have been hard pressed not to become disturbed. CS: Is it also a religious play? Will I walk away wanting to become a Quaker? JS: (Laughs) I don’t know- I don’t think so. It’s much more about tolerance than it is any kind of missionary piece. Mary was always driven by a deep belief that love and grace are more appropriate expressions by clergy than totalitarianism marked by torture and execution. She had an intense moral compass and couldn’t accept the status quo. I hope that you’ll get a chance to see the show and meet her. She’s really something. CS: At this point you’re doing a series of dramatic readings rather than a full-blown production, is that correct? JS: Yes. We’re going to be doing readings, collecting donations and raising the money to stage the show in a theatre. We’re looking at several different spaces. Meanwhile, we can raise a bit of awareness about the Quakers and the Rocky Mountain Peace and Justice Center, here in Boulder. They have been doing such great work for so long and they’re always in need of support. Half of the proceeds will go to them, and the other half will go to Universal Arts Boulder, a new company that a group of us have started. This is a very exciting time of life for me, that’s for sure. 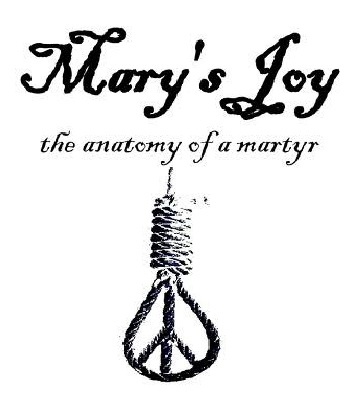 Playwright and actor Jeanmarie Simpson’s one-woman show is called Mary’s Joy: The Anatomy of a Martyr and it’s currently playing in Boulder, Colorado. For more information please visit universalartsboulder.wordpress.com or jeanmariesimpson.wordpress.com.